This is some really amazing stuff from Rowan Atkinson. 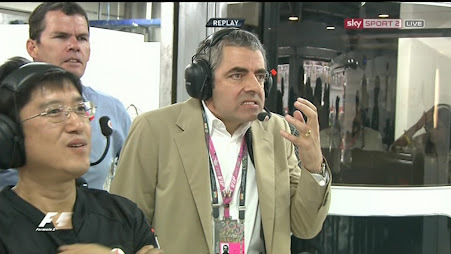 I've been watching F1 for over a decade, but I've never seen such vivid reactions from any celebrity during races. They all seem so overly calm, it always seem like they have no clue what's going on and that they don't really care (which is quite likely, actually). But Mr Bean blew that away! Invite more comedians to F1! Especially if they're motorsport fans!